Beat writer Ryan Divish goes against his best instincts and dives into his Twitter mentions for the Mariners Sunday Mailbag: Inside information, food recommendations and healthy serving of sarcasm — every Sunday. Get your questions in by tweeting @RyanDivish. With the Mariners off to an unexpected and somewhat inexplicable start to the 2019 season, there has been a more optimistic and hopeful tone to the questions submitted for the weekly Twitter mailbag. This is unfamiliar territory. But fear not, the answers supplied to these enthusiastic and positive questions will be met with the sometimes-sarcastic, always-sardonic and usually factual answers. It’s all about having a good approach, building and maintaining a good routine and trusting that process. As always, these are real questions submitted to the currently cheery group of folks known as my Twitter followers. April 7 | Why is the bullpen so combustible, and what can be done about it? March 24 | What to expect from Felix Hernandez this year? I’m assuming that no matter how good our record is by the trade deadline we will still be sellers with 2021 in mind. Jerry wants sustained long term success not just a 1 year playoff run. Is this a fair assumption? Well, you know what they say about the word “assume” and its variations … it’s weird sounding. But you are correct in that general manager Jerry Dipoto will not let this early season success lead him into a trading frenzy where he deals away all the prospects he acquired this offseason as part of the “step back” plan for the organization. Obviously, this unexpected start to the season has been fun for fans to watch and embrace. And the first 16 games have shown that this team is probably better than first expected. The offense, the power and the consistency of the approach at the plate makes the team more viable. But the defense and bullpen issues aren’t going to be remedied quickly or completely. It will lead to some regression. Back in March when I was working on the main story for our special section on the step back, Dipoto talked about the scenario of being in wild-card contention this season and what he would do. So what if the Mariners have a start similar to 2018? Remember they were up 12 games for the second wild card in mid-June and in the race in July. The longest postseason drought in North American professional sports can’t take precedence over the plan they put into place, which was to get out of the idea of playing for a second wild card spot every year and playing for something more. Reasonably, the Ms end May at 10 games above .500 (35-25). Do they make a move? Reasonably they get to the All Star break at 10 games above .500. Then? At some point they need to break the log jam at 1B/DH. It seems kind of odd to speculate about future thinking when so much can change over the time frames you listed. They’ve played 16 games coming into Saturday, which is basically 1/10th of the season. On May 31, the Mariners will play their 60th game of the season. 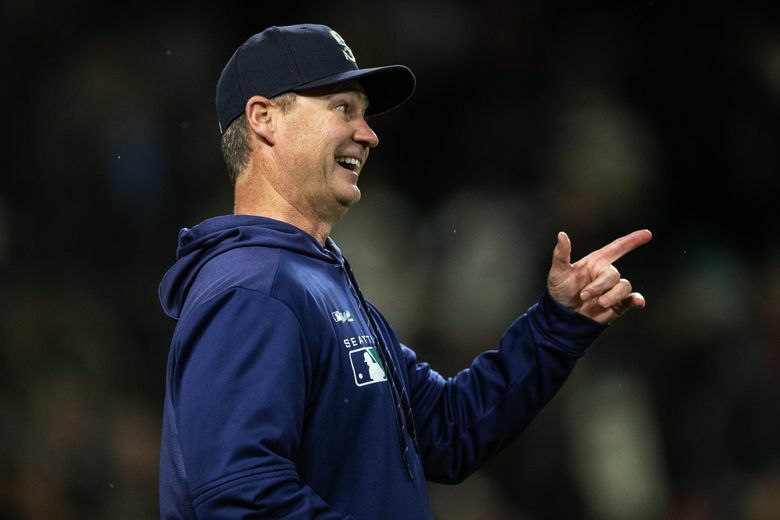 It’s about the number of games that Dipoto told columnist Larry Stone would be indicative of who this team really is and what it’s capable of doing this season. It’s a span of 44 games in which so many things can happen. Could they regress into the team most people expected? It’s possible, if not realistic. Could they continued to exceed expectations over that stretch? They’ve shown they are capable of it in this small sample size. What will almost certainly change is the makeup for the 25-man and 40-man roster due to player health, player performances – both good and bad — and typical attrition and roster maneuvering. To base a future decision based off a current roster isn’t necessarily prudent. Needs, strengths, weaknesses will change in that time frame, including the log jam at first base/designated hitter. Dipoto can always make a move, regardless of the team’s record. But perhaps it depends on your definition of “move.” Sure the Mariners could find ways to improve their bullpen or maybe make a move at their utility player spot. But they aren’t going to trade away the prospects acquired. It would be totally pointless and irresponsible to trade a prospect like Justin Dunn for a veteran reliever. The moves will likely come in minor-league trades that involve players designated for assignment, waiver claims and minor-league signings. If by the All-Star break, which is 78 games from Saturday, the Mariners are 10 games over .500, then the search for supplementing the roster could reach a different level. Do the Mariners have the money to be buyers this summer if they are in the hunt for the playoffs? Sure, they have money because there isn’t a salary cap in baseball. There is the competitive balance tax, which penalizes teams that carry a payroll above a certain threshold. Those teams are taxed on each dollar above that threshold figure. That tax rate increases each year a team’s payroll remains above the CBT. The 2019 CBT threshold is $206 million. The Mariners’ current payroll is just over $160 million, despite shedding the contracts of Robinson Cano and Jean Segura. But they have room to spend more money without being penalized by baseball. Realistically this is the best way for the team to add big-league pieces without sacrificing their prospect capital. They could take on salary for this season and perhaps next to get a player to help. They should definitely do everything possible to hold on to the key young players for next season and beyond, but they don’t have to hold on to dollars this season if it means making the wild-card game, particularly with their payroll decreasing significantly in 2020 ($86 million in committed salaries) and 2021 ($40 million in committed salaries). It’s not like ticket prices, parking prices or beer prices have gone down. what happens if we go .500 for the rest of the season? As of Saturday afternoon, when this is being answered, the Mariners are 13-3. That means there are 146 games left to play in this season – dear god, the season is long – and they would have to go 73-73 over that span. That would give Seattle an 86-76 record. Would that be good enough to make the wild-card game? It wasn’t good enough last year. If you recall, 89 wins were not good enough. Even with their injuries and generally poor play early on, the Red Sox and Yankees are expected to be in the wild-card game. The American League projects to have three dominant teams – Boston, New York and Houston. The next tier has three very good teams – Oakland, Tampa and Cleveland. And then there are the other nine teams with varying levels of talent and expectation. Does it feel like 86 wins would be better than whatever Oakland or Tampa would produce? No. You’ll be wondering for a while. It’s one thing to “open the checkbook” and spend legit money on good players, but there’s a point where the investment would never yield a comparable return in terms of production. Giving Dallas Keuchel $20 million for a season would be beyond stupid because you aren’t getting him for a full season. Let’s say the Mariners signed Keuchel on Monday. It would take him about three weeks to get ready at a normal rate. It doesn’t matter if he’s been throwing bullpens and simulated games, the process of getting him game ready takes time. And you certainly don’t want to rush the process to where injuries become a factor. So now you get him around the first week of May. Also Keuchel’s velocity and command have trended down over the past few seasons. There’s a reason why he never got the contract he wanted this offseason. He’s already turned down the qualifying offer of one year at $17.9 million and a five-year deal from the Astros. Even the Yankees, with all of their injury issues, aren’t looking to sign him, opting to possibly add Gio Gonzalez, who signed on as a minor-leaguer. As a reliever, Kimbrel wouldn’t need as much time to get ready. The moment Kimbrel would lower his demands into an area that would make sense for the Mariners, teams like the Nationals and Cubs would figure into that market. But beyond the cost and uncertain return, another major road block that prevents this from happening is the draft pick compensation that comes with signing a player on a qualifying offer. The Mariners would have to give up Pick No. 77 of the upcoming draft. And Dipoto does not want to give up draft picks as he tries to re-stock the farm system. Vegas set the Ms over/under line at 71.5 at the start of the season. What would you say the number would be now after this start? So I don’t know much about sports gambling or gambling of any sort. My fine Catholic school education taught me to avoid such indulgences. I may or may not be lying. But it’s important to remember about betting lines, win totals and futures odds, Vegas doesn’t make those based simply what they think will happen. No, they set these lines and totals and odds in a way to maximize betting action on both sides of the number. That way, the house is always making some money regardless of the results. It’s why betting lines on football games move throughout the week. It’s not because the Vegas oddsmakers think that one team is suddenly becoming just a little better to become a 3.5 favorite instead of a 2.5 favorite. The 71.5 win total for the Mariners was a number where Vegas expected to get action on both. But obviously now, since the Mariners have won 13 of their first 16 games, that total number to bet would be very different because, well, they’ve won 13 of their first 16 games. That far exceeds a pace projection for the total. Do you think the recent trend of teams buying out their young stars before free agency effects the Mariners future plans? With this supposed to be a rebuild a lot of talent is not going to be available in a few years like was thought. Well the players that are being signed to extensions weren’t necessarily players that were going to be free agents in 2021 or 2022. Sure Mike Trout was scheduled to be a free agent in two years, but thinking they had a chance of signing him would be like thinking there’s a decent-sized, three bedroom house in Seattle that’s under $500,000. There will always be players that prefer to bet on themselves and their talent in search of a bigger payday on the free-agent market than taking the security of a lesser deal. It’s often determined by what their agent is telling them as well. But the big part of the Mariners’ step-back plan was to accumulate enough talent in their own organization and develop it into quality players so they wouldn’t be too reliant on players in free agency to provide the production needed. Does the Mariners current success impact how they will use their young arms this year (Sheffield and Swanson but possibly Dunn as well)? Do you think we’ll see them in the rotation or possibly bolstering the bullpen at some point this year? No, they will not forsake the health of their future players to steal some innings this season. But part of their plan is to control the innings, usage and pitch totals for pitchers like Justus Sheffield, Erik Swanson and Justin Dunn all season. The plan for Yusei Kikuchi to make one one-inning start every month to lessen the workload will also be used for Sheffield, Swanson and Dunn. By doing that throughout the season, it allows them to pitch a for a full season without exceeding innings restrictions. It’s a plan that will give Sheffield and Swanson a chance to make starts late in the season at the big-league level if needed. What do you think is the plan for if or when Crawford proves ready and current players are still performing? Does Beckham go to third? While it isn’t a priority, it would be wise for the Mariners to wait until June 1 to bring up J.P. Crawford. There are some service-time issues and his clock toward free agency that would be at stake. By waiting until June, they would ensure another year of club control. Ultimately that may not matter with Crawford, but it’s still logical to do now. Crawford has gotten off to a strong start with the Rainiers, but they won’t call him up until they believe he’s ready to handle extended Major League playing time. As for third base, Kyle Seager is the starting third baseman when he returns from the injury. Depending on the team’s record and his performance going forward, Beckham may or may not be on the team in July. If he is, he could play the utility role — seeing time at shortstop, second base and third base. It’s a role he filled in Tampa and Baltimore. They would certainly give a left-handed hitting infielder a day off against tough left-handed starting pitchers and have Beckham make the start. Been hearing and reading a lot about Jay Bruce mentoring the young players on the team and helping their approach at the plate. Combining that with 7 homers, not bad for a veteran contract throw-in that was expected to be quickly flipped, no? You have heard correctly. Jay Bruce is an excellent teammate and a player that younger hitters have gravitated toward since he first arrived at spring training. The Mariners knew this about him when he was made part of the seven-player trade with the Mets. In a trade where they had to take on big league contract to even out the money aspect, the Mariners knew there was upside with Bruce in multiple ways. They felt that even if he wasn’t with team more than just the first half of this season he’d still provide a positive impact on players that are still trying to establish themselves as big-league players. And if Bruce continues to hit, he could be traded at the deadline for a prospect and some salary relief. If Felix’s performance is similar to last year, do they try moving him to the bullpen where we could use some “help”? This is with the assumption Felix would be willing to move I guess. Felix Hernandez doesn’t have a choice on whether he will go to the bullpen or not. He believes he’s a starter, but that doesn’t mean he will get to stay there if he fails to perform. They crossed that bridge last season and won’t be afraid to do it again. Of course, if it reaches that point, the Mariners could always release their erstwhile ace and move on. His contract is up after this season and he won’t be back. So they could start the process early. But that decision isn’t just made by Dipoto or Servais. Walking away from the face of the franchise, who is making $27 million this season, is a decision that must be approved by ownership. Looking back at what went sour in 2018, did the return of Cano hurt the team? How likely is the return of Seager a negative? No, the Mariners’ poor approach at the plate and the panic of the A’s catching them and passing them were bigger factors as was the un-wise decision to move Robinson Cano, Dee Gordon and others all around the diamond in the search to find offense. The Mariners played well immediately after the suspension of Cano, but that was based largely on Edwin Diaz and the bullpen winning every close game and Mitch Haniger and Jean Segura carrying the offense since the rest of the lineup was scuffling. When Segura started to fade after the all-star break, the offense went from bad to awful. It’s odd that people seem to think of Seager as this divisive presence. He’s still in the clubhouse every day and interacting with teammates during home games. His defense will be a plus for this team and you don’t know what you are going to get from him offensively. What if he returns to being a hitter similar to two seasons ago? Would that be a negative? Is this team really that fragile that a return of one player is going to derail it? If that’s the case, then the team has bigger problems. heading to KC next month, can I get a BBQ recommendation? I’d recommend the Z-Man from Joe’s, which is my favorite place. A lot of people don’t like Q39 or Jack Stack because they feel they are upscale. I don’t mind clean places. In fact, I prefer them. Pictured in the tweet are Joe’s and Q39. What is your cholesterol after going to KC? I know I postponed my annual physical that was scheduled after this trip. What's the best pizza in Tacoma? The Cloverleaf is the best. You have to wait a little longer, but have a pitcher of beer, eat some popcorn and get a House pizza. I’d rate Puget Sound Pizza and Hank’s as close runners up. I left out even local chains like Zeek’s, Farrelli’s and The Rock. Do you recommend using a Kale Pesto instead of BBQ sauce? Yes, if you swallow some poison and can’t find any ipecac, kale pesto works well. You can also use it clean your gutters.